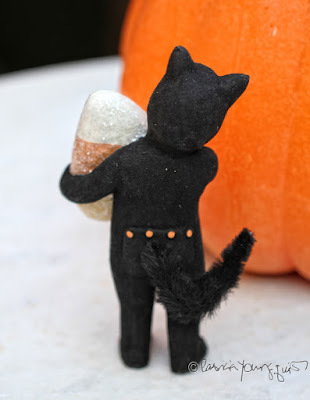 The Last Leaf Gardener: Time to Celebrate National Candy Corn Day (But Keep Honoring Black Cats Too)! Time to Celebrate National Candy Corn Day (But Keep Honoring Black Cats Too)! A few days ago, in honor of Black Cat Awareness Month, which is October, Patrick McDonnell, the creator of Mutts, posted the image seen atop this entry on the Facebook Page for that comic strip. But it seems that black cats steal more than hearts, it appears they steal candy corn too, as evidenced in the next image. And who could blame a black cat for wanting a piece of candy corn, a sweet treat that has it's own holiday, known as National Corn Day, which is today. According to a page on punchbowl.com, "candy corn has been around for more than 100 years and has never changed its look, taste, or design." The aforementioned page states, "George Renninger of the Wunderle Candy Company created candy corn in the 1880s. It was made to mimic a kernel of corn and became instantly popular because of its innovative design. It was one of the first candies to feature three different colors!" They also claim the following: "Today, candy corn is a favorite American treat to enjoy during the Halloween season. The National Confectioners Association estimates that 20 million pounds of candy corn are sold annually." 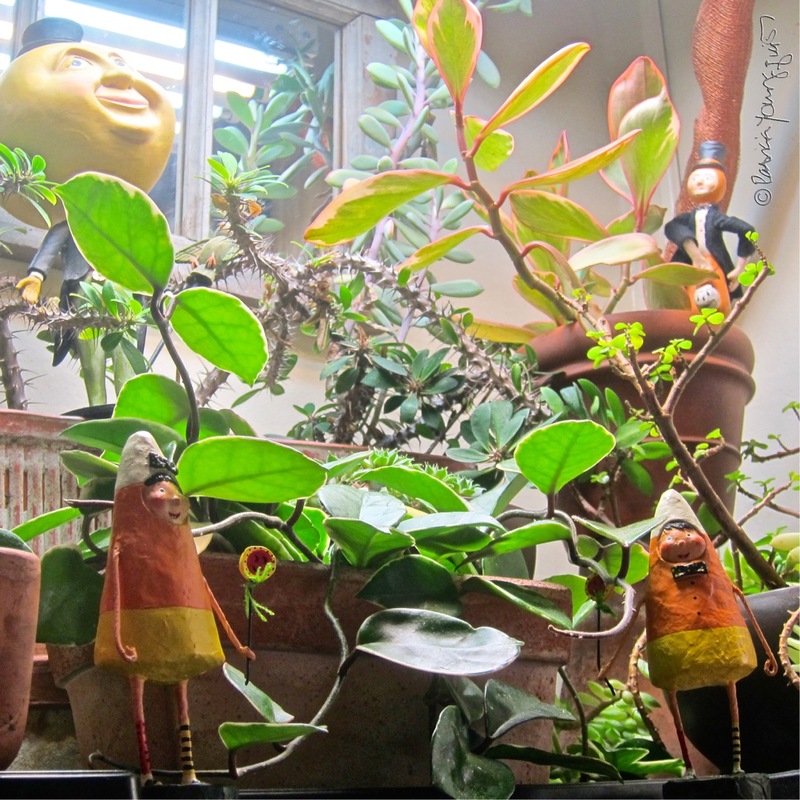 Because certain candy corn twins began visiting my indoor succulent garden (an example of this is featured below where they are standing on either side of a Hoya plant that was growing there at the time), I'm no stranger to this news. The twins began visiting me six or seven years ago and have always they told me about this holiday, for they saw it as their bragging rights. They also informed me (by quoting a web-page for Foodimentary), that "One serving of candy corn contains only about 140 calories. Candy corn has 3.57 calories per kernel. More than 35 million pounds of candy corn will be produced this year. That equates to nearly 9 billion pieces — enough to circle the moon nearly four times if laid end-to-end. 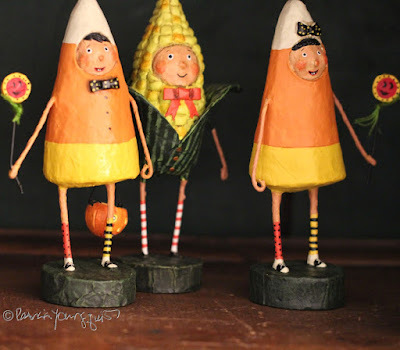 Halloween accounts for 75% of the annual candy corn production. A cup of candy corn has fewer calories than a cup of raisins." 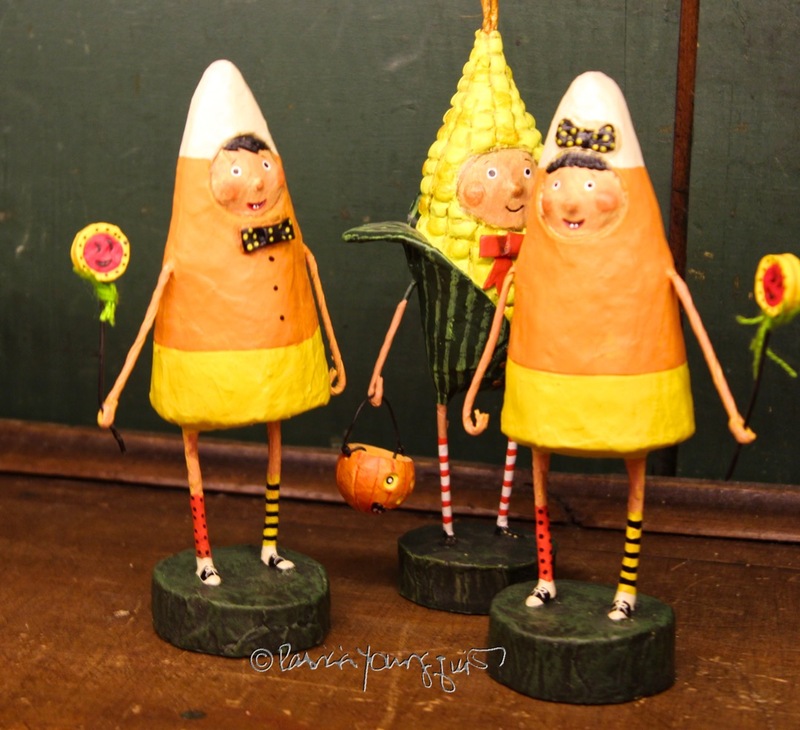 Moreover, the twins also reported that their holiday of National Candy Corn Day, "is intended to celebrate the beauty of corn, and the deep autumnal colors. During that time winter was a long and cold affair, with electricity not quite having come into common usage. The bright colors of these candies could last throughout, bringing both a visceral joy and a burst of much-needed sugar during the dark time of the year." The idea that this holiday honors the beauty of corn was not lost on another one of the characters who visits me during the holiday season. She can be standing behind them in the next two pictures. 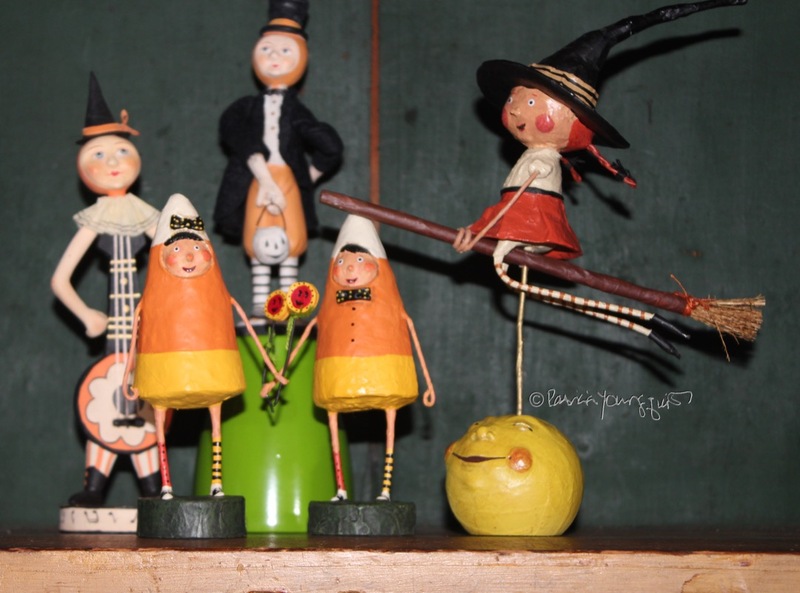 The Candy Corn Twins have always been welcoming to other figurines who visit here, as evidenced below. But, there are a couple of exceptions when it comes to some visitors being welcomed with open arms by The Candy Corn twins. 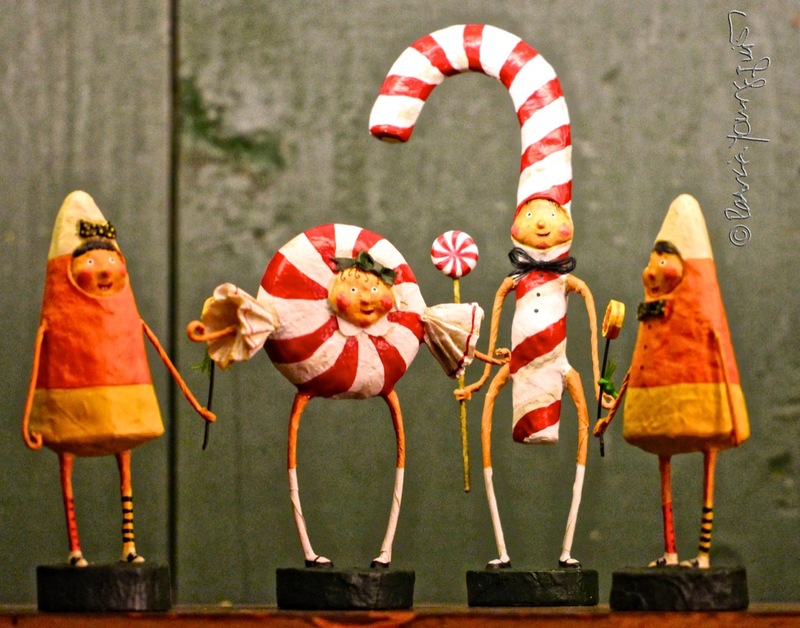 These include the peppermint figurine as well as the cane figurine, who are pictured below with the twins. Years ago, The Candy Corn Twins did not hesitate to reprimand the Peppermint People (since their presence represents Christmas), telling them not to rush our lives away by showing up in my home before Halloween. 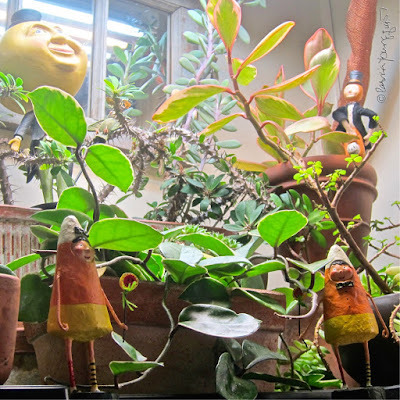 The twins chastised the Peppermint People saying "it's bad enough that stores began playing Christmas music before Halloween, but one does not have to succumb to pressure in their home!" A story re the altercation between the Candy Corn Twins and the Peppermint People can be found by clicking here. In any event, now, as I'm about to conclude this entry re National Candy Corn Day, the twins have asked me to inform you that, "while most people are familiar with the orange, yellow and white colored candy corn that is sold around Halloween, there are a few variants of this candy manufactured as well. For instance, a treat called Indian corn is sold around Thanksgiving and this treat looks like candy corn except it has a chocolate tipped end instead of the normal white end. Around Christmas, there is a product made called reindeer corn. This candy corn variant is red and green. Around Easter, there is also what has been dubbed bunny corn. A product that is manufactured in several different pastel colors." They have assured me that this is not fake news, which I verified and you can too by clicking here. 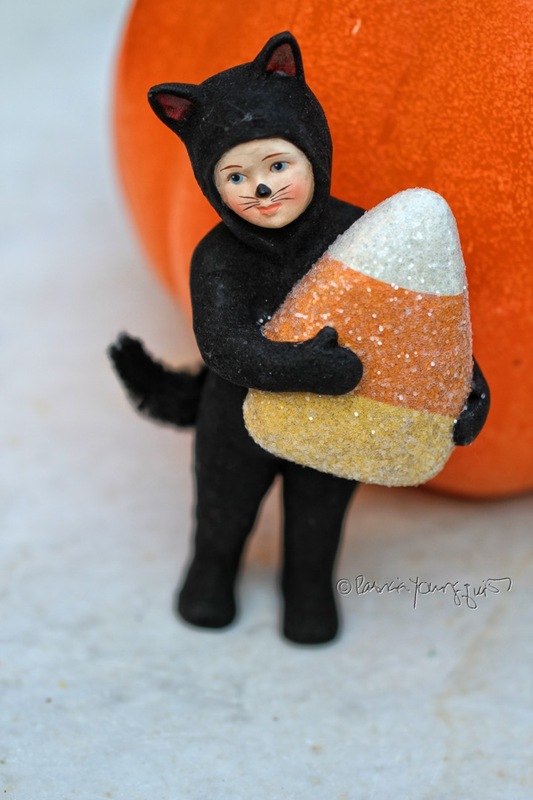 And with this info from the twins, I conclude my post re National Candy Corn Day, which always come the day before the last day of October, a month that seeks to raise awareness about black cats (which was the topic of one of my 2011 blog posts). Now, before I go, I want to ask you dear reader, to keep in mind that even though the month is ending, the needs of black cats are year round. 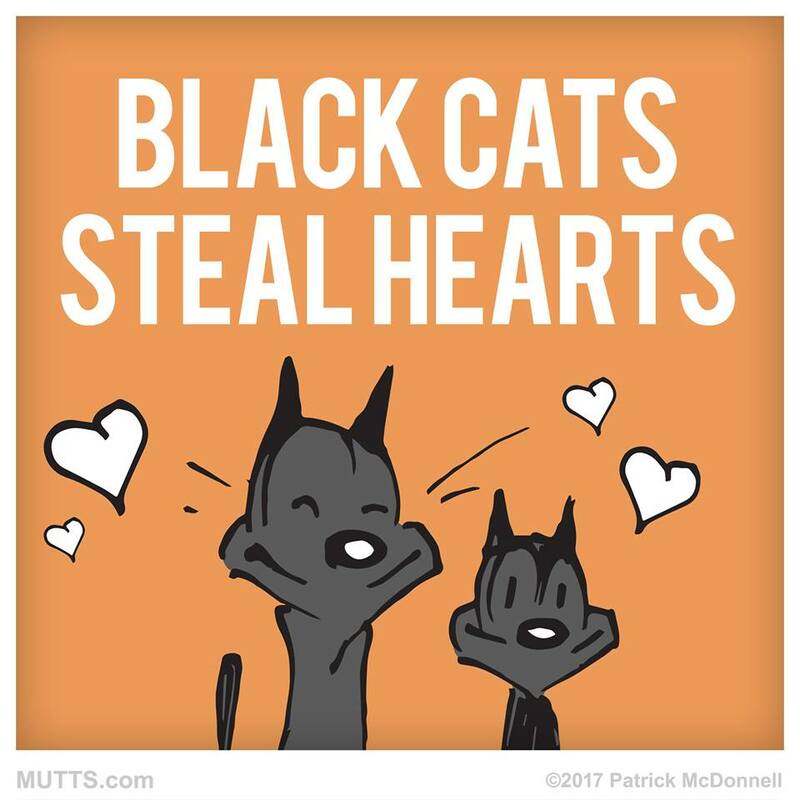 For if one can eat candy corn all year, one can certainly consider black cats year around too... even if they steal your candy corn along with your heart.